ARCHOS, award-winning for its technology innovation and leadership in portable media players (PMP), introduces a new Internet Media Tablet concept by announcing 3 new devices: the Archos 5, Archos 7, and Archos 5G. The new devices still offer many of their predecessor’s features, such as video and music playback (MPEG4, AVI, WMV, MPEG2, h.264, MJPEG, DIVX, MP3, WMA, AAC, WAV), a photo viewer, touch-screen navigation, a Flash-enabled Web browser (Opera), DVR capabilities, games, and Mac/PC compatibility. Some useful hardware features such as a fold-out kickstand, integrated speaker, and 3.5mm headphone jack are also included on the new Archos tablets. The new Archos devices go further than that. Archos 5 includes a revamped, thinner design with fewer buttons, a larger screen (4.8 inches), higher capacity, a considerably faster processor (ARM Cortex), and support for 3G and 3.5G (HSDPA) cellular data connections. That allows you to browse the Web over both Wi-Fi and 3G cellular connections. For Archos 5 and Archos 7 to connect to 3G network, a 3G USB modem from your carrier is required. Whereas, Archos 5G model includes a built-in slot for your existing SIM card. However, Archos doesn’t include a built-in microphone on any of the new media tablets. Thus, using the 3G capabilities to place VoIP calls seems unlikely (but not impossible). Archos 5, 5G and 7 comes with a full Web browser and large touch-screen keyboard. That makes it easy to maintain your presence on social networks such as Twitter and Facebook. The new Archos works with newly redesigned dock connection that offers the helmet cam, extended battery dock, and a DVR station which now offers HDMI output and composite video input, and optional GPS cradle. From software side, a new HiDef video software plug-in is now available ($20) that lets you playback 720p video resolution at 24 fps MPEG4 and WMV formats, which is ideal to connect the player to a high-definition TV. After the new Archos is registered, two plug-ins will be activated free of charge, including the Flash 9-enabled Opera Web browser, and a Web TV/Radio plug-in. 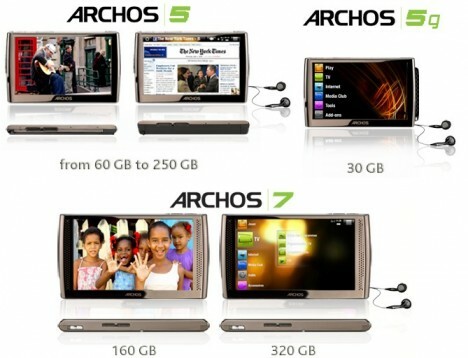 Archos 5 is available in 60GB, 120GB, and 250GB capacities, priced at $350, $400, and $450 respectively. The 7″ TFT LCD’s Archos 7 is priced at $450 (160GB) and $550 (320GB). Finally, the Archos 5G, with its built-in SIM card slot, will become available in December with a premium price tag of $550 (30GB).